We should have been celebrating five years of South Sudan’s independence. Instead, we hear gunfire and explosions, and watch people run for their lives. Some of our team members have had to take shelter in churches or at the homes of relatives. Monday’s cease-fire in South Sudan’s capital city, Juba, must hold if the embattled country wants to keep alive hope for a lasting peace agreement, says the global organization Mercy Corps. According to news reports, more than 300 people have been killed in violent clashes since last Friday. All Mercy Corps team members in South Sudan are safe and accounted for, and Mercy Corps continues to provide critical services. Since the conflict began in 2013, about 2 million people have been forced to flee their homes. Severe hunger looms for more than 6 million people across the country and families everywhere are struggling. Mercy Corps delivers essential supplies as well as fishing and farm tools, creates jobs through cash-for-work projects, provides clean water and sanitation services and operates safe spaces for children. The organization reaches about 150,000 men, women and children in South Sudan each year. 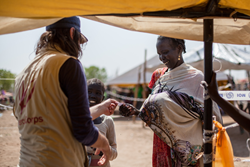 To support Mercy Corps’ work in South Sudan and around the world, join us at mercycorps.org.